In July 2001 the Vienna improviser/composer/producer Werner Dafeldecker and Franz Hautzinger invited the Japanese electronic artist Sachiko M and the dean of British new music, John Tilbury, to Vienna to record together (the recording sessions were coupled with a performance of the quartet at the Nickeldorf Konfrontationen). The point was to set up a group that improvises, that therefore has an existence beyond the studio and producing, that, however, should not sound like a classical improvisation combo. An experiment that can only succeed, when the musicians are excellent improvisers but whose musical activities are not assimilated into the improv scene. If this didn't sound so bureaucratic, then one would have to say: the musicians of this quartet fulfil these requirements impeccably. Werner Dafeldecker and Franz Hautzinger hardly need an introduction here. Both are GROB recording artists (Dafeldecker: Eis 9, GROB319, sssd, GROB431, Duo recordings with the organist Klaus Lang GROB541. Hautzinger: Gomberg, GROB211, Dachte Musik, GROB313/4; Bailey Hautzinger, GROB425; in the middle of next year his duo recordings with pianist Manon Lu Winter will appear), both have worked intensively on new sounds and on new sound definitions. Dafeldecker as a multi-instrumentalist (bass, guitar, electronics, percussion), Hautzinger as a trumpet virtuoso, who has transferred his virtuosity completely into a new language. Very noise-y and still deeply melodious. Sachiko M is known above all through her cooperation with Otomo Yoshihide. Within a musical network, from more or less dense sounds, she works entirely linear and reduced: she generates a few sinus waves, a few clicks 'n' cuts. She does this, however, with an extreme concentration and perseverance. They are her sounds that organize and burst open the performances, that give an improvisational interaction a sharp contour, so sharp that the music nearly becomes piercing and overdrawn. Although so little happens. John Tilbury has been a fixed member of the legendary improvisation group AMM for over 20 years. The pianist who is considered to be the David Tudor of Great Britain, as a great master of the interpretation of new music, is also a brilliant improviser: Morton Feldman on acid. Reduced playing, but always surreal, often setting single chords that, however, are on the dot, but no: that are always a little bit off, and never classifiable to 100%. 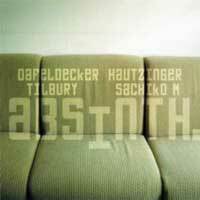 Absinth consists of live and studio recordings, selected, produced and filtered again and again by Dafeldecker and Hautzinger. One hears not only the collaboration of these four excellent musical personalities. One hears above all how four individual sounds are synthesized into one-in real time and without one of the individual voices deceived of its content. Improvised music par excellence.